India Va SA T-20 Results went in favor of India. A clinical performance by Indian eves on Saturday saw them clinching 5 matches, T-20 series with the margin of 3-1. One match ended in no results as it got washed out. 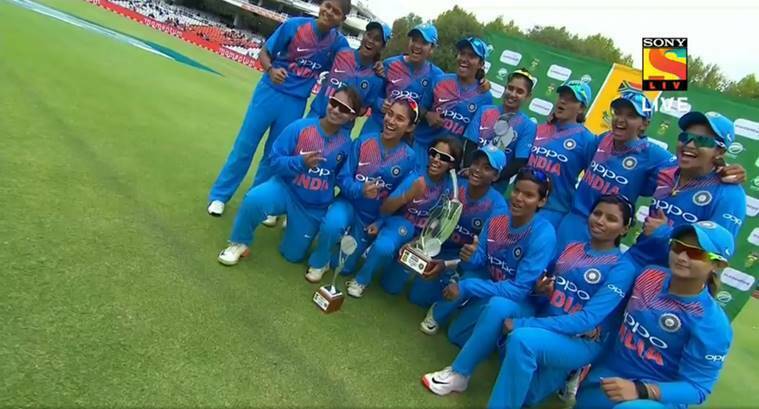 Indian Team lead by skipper Harmanpreet dominated the South African team throughout the tour. On Saturday it was former captain Mithali Raj who once again did the bulk of scoring by making with a quick fire 62 of 50 balls helped India to post 166 on board. Chasing this challenging target was never easy for South African eves. As brilliant spells from Rumeli Dhar and Shikha Pandey bundled out SA for only 112. Rumeli Dhar, Shika Pandey, and Rajeshwari Gayakwad took 3 wickets each. On Saturday Indian team showed it’s character to come out victorious in T-20 series by clinching the nail-biter against the host. The match which went the way the very last over produced an exciting finish. It was Bhuveneshwar Kumar who held his nerve and delivered it for India. Chasing a target of 173 in 20 Overs, SA made a slow start. However, JP Duminy started to pick up the pace, later on, to put up some fight. The moment JP Duminy was gone with 41 balls 55 it seemed that India won’t be much troubled now. But Christiaan Jonker had some different plan as he smashed Indian bowlers all over the park and took the game to the last over. With 18 need of the last over, B. Kumar held his nerve to hand India a series win, India won the match by 7 runs, Jonker made fighting 49 of 24 balls he was dismissed on the last ball of the match by B. Kumar. Earlier made to bat first after losing the toss, India made a quick-fire start as Stand-in skipper Rohit Sharma scored 13 in the very first over. However, his inning was short lived as he once again fell to Junior Dala. Playing with ace batsman Virat Kohli, Indian team could have been in deep trouble, but thanks to comeback man Suresh Raina. Who played a breezy knock of 43 from 27 balls, he started his inning by sending the best SA bowler Junior Dala for a six on the very first ball he faced. Dhawan also played good hand making 47 of 40. He was struggling earlier in the inning but got helped by the poor fielding of Shamsi who dropped him twice. Indian couldn’t repeat the flourish they had in the previous t-20 and were only managed to score 172 in 20 Overs. However, it proved to be enough in the end. Man of the match awarded to Suresh Raina, Man of the Series Bhuvneshwar Kumar.